In congruent angles we will learn how to recognize that when two angles are congruent. Suppose ∠LOM = ∠PON having same vertex O. Now we will verify their congruence. 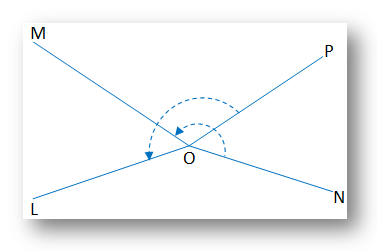 A straight line QOR is drawn through point O and a perpendicular xy is drawn on QOR at O. With respect to the axis of reflection xy, ∠P’ON’ is the image of ∠PON. Now with centre of rotation O, OP’ is rotated through such an angle in anticlockwise direction, so that OP’ coincides with OM. Since ∠P’ON’ is rigid figure and equal to ∠LOM, ON’ falls on OL. With O as center of rotation, OP is rotated through such an angle (in anticlockwise direction) so that OP lies on OL. In the same manner ON being rotated equally, falls on OM. If two equal angles are at different positions but lie on the same plane. ∠LMN and ∠PQR are two equal angles at different positions but lie on the same plane. 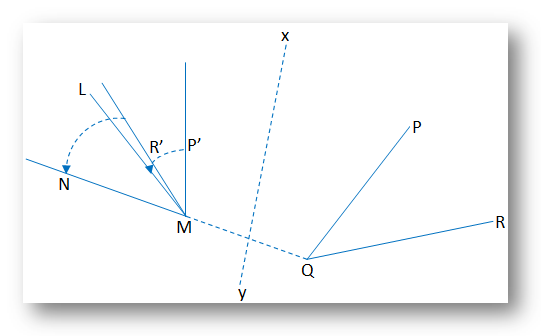 Taking xy, the perpendicular bisector of MQ as the axis of reflection, the image of ∠PQR is ∠P’MR’. 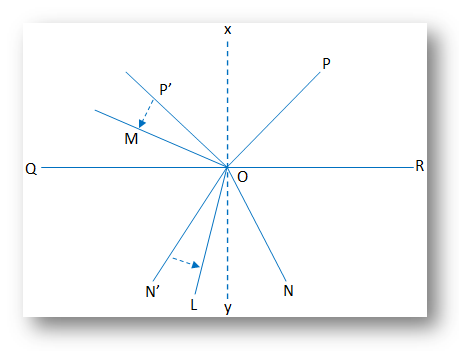 Now observe that ∠LMN and ∠P’MR’ are two equal angles sharing common vertex M.